The state activated a Hazardous Materials Task Force to help poultry facilities hit by the bird flu. The task force includes firefighters from Burlington, Cedar Rapids, Council Bluffs, Muscatine and Sioux City. Sioux City Assistant Fire Chief, Jim Clark, says the firefighters will first deal with the vehicles that’re are taking away the millions of dead birds. 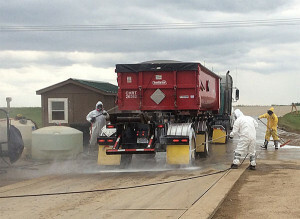 “Making sure that all of the trucks leaving with the roll-offs from the different facilities are properly decontaminated. The biggest fear is that this avian flu spreads, and so we’re trying to contain that,” Clark says. He says they also have to inspect the roll-off containers and the bags containing the dead birds. “Their job is to make sure that the bags are not leaking — or that they are not swelled up — so that when they get moved off the site they don’t have any problems with the bags being compromised,” Clark says. Clark says the firefighters who are trained in handling hazardous materials are both teaching and learning as they work at these facilities. Clark says a total of 11 Sioux City firefighters have seen duty at poultry farms and landfills as part of Iowa’s Hazardous Materials Task Force.